"We saw a shiny black cloud coming from the south, moving above and through the trees, which spread across 70 miles. We shut our eyes as they began to burn. In the days that followed, about 50 Yankunytjatjara people in Walatina began to complain of skin rashes, sore eyes, vomiting, diarrhoea and coughing. There was no treatment on the cattle station. The closest health clinic was hundreds of miles away and we had no transport," says Yami Lester, who was living160 km from Emu Junction in South Australia, the site of the first nuclear test on mainland Australia. Lester managed to open his eyes after three weeks, but couldn't see anything with his right eye. The left eye, he reckons had about 70 per cent sight. By February 1957, he was totally blind and now he is confined to a wheelchair following a stroke last year. An advocate for nuclear abolition, Lester has thrown his weight behind the Australian Red Cross' recently launched 'Make Nuclear Weapons the Target' campaign. 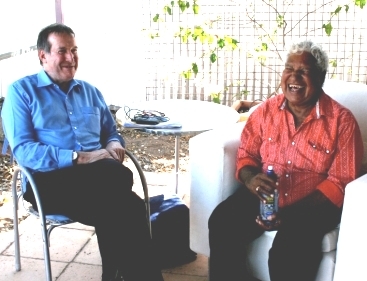 He says, "When the British and Australian Governments conducted the tests at Emu Junction, and later at Maralinga over half a century ago, we were unaware of the life-long damage it would cause to our people and homeland. This campaign will educate indigenous people and make Australians aware of the damage nuclear weapons can do and why there is an urgency to get rid of them.". Make Nuclear Weapons the Target campaign, which kicked off on August 6, 2011 with a major referendum on Facebook, highlights the humanitarian and environmental imperatives for nuclear disarmament. It is calling on all Australians, especially the young generation, to finish what their parents started. "The anti-nuclear debate defined a generation in the 1960s and 1970s, but fizzled out before real change was cemented. In 2011 nuclear weapons are an even bigger threat than ever. It's time for Baby Boomers to reconnect with the cause and a whole new generation to get involved," says Australian Red Cross CEO, Robert Tickner. In June, the prestigious Stockholm International Peace Research Institute (SIPRI) stated in a report: "More than 5,000 nuclear weapons are deployed and ready for use, including nearly 2,000 that are kept in a high state of alert.". Worldwide today there are at least 20,000 nuclear weapons in existence with a destructive force estimated to be 150,000 times that of the Hiroshima bomb. "What we are seeing is the proliferation of nuclear weapons to new countries, the risk of non-state actors getting nuclear weapons and the threat of accidental firing of these weapons giving rise to a conflict. Our campaign aims to promote public awareness on these issues within Australia. We would like to see some form of international convention that declares the use of nuclear weapons to be prohibited under the International Humanitarian Law (IHL)," adds Tickner. The Red Cross mandate in the IHL, which prohibits use of weapons or methods of warfare that do not distinguish between civilians and combatants, makes it a leading voice in calling for the prohibition of the use of nuclear weapons. Australia, along with 194 nations, has ratified the four Geneva Conventions and their Additional Protocols, the universal rules of war. As Australian Red Cross' Head of International Law and Principles, Dr Helen Durham says, "From the legal point of view it doesn't make sense that we as humans have in our powers, across the world, the capacity to use weapons that don't distinguish between civilians and combatants and cause incredibly unacceptable suffering not just to humans, but also to the environment and a whole range of infrastructure. So there are real legal imperatives for the world to work in a more focused way on nuclear disarmament”. Likening the international community to a pilot "asleep at the controls of a fast-moving aircraft", former United Nations Secretary General, Kofi Annan, had criticised the lack of a unified, global strategy for disarmament and non-proliferation as the main reason that nuclear weapons still threaten humanity. Australia is in an interesting situation because as a country it doesn't have any nuclear weapons although it does have arrangements in place in relation to defence with the United States. The country also has nearly half of the world’s commercially-recoverable uranium, and the Australian Bureau of Agricultural and Resource Economics forecasts that Australia’s uranium exports may reach a little over 17,000 tonnes within five years. "Australia must introduce steps to ensure that any exported uranium is used solely for peaceful purposes, such as energy generation and medical usage," says Dr Emily Crawford, Postdoctoral Fellow at the Faculty of Law, University of Sydney. The Australian Red Cross has written to all members of the Australian Parliament seeking support for a convention to prohibit the use of nuclear weapons. "We are very confident and optimistic that we will get that support. We believe this is an absolutely fundamental international humanitarian issue falling squarely within our mandate and that is why we are happy to take this initiative into the public domain and seek support from parliamentarians, the government and the wider community," says Tickner. The campaign, which is designed to reignite national and international debate on the issue, has 96 per cent of the people voting online to ban the use of nuclear weapons. Use of social media has proved a vital and useful tool in getting this important message across, especially to the younger generation. Peter Giugni, International Humanitarian Law (IHL) officer, has been organizing events and seminars on the campaign in regional New South Wales. He says, "People are disappointed that the international community still hasn’t resolved to prohibit these weapons against humanity and they are very supportive of Australian Red Cross speaking out." The campaign will build to a climax in November with more awareness events and public forums planned for the New Year. As Dr Durham says, "Countries around the world, wherever they are, need to understand that their citizens are concerned about this topic. It is really about everyone standing up and saying these weapons are unacceptable. The Australian Red Cross is taking the lead towards an international meeting in November in Geneva, where all Red Cross and Red Crescent Societies from across the world will meet with the desire to create a global Red Cross Red Crescent policy on nuclear weapons." In 1950 the International Committee of the Red Cross publicly called on States to take all steps to come to agreement on the prohibition of atomic weapons; there have been numerous efforts to make the use of nuclear weapons illegal but, 66 years on, tangible change still has not been achieved.